In October, readers will get a chance to see a little piece of Sina Grace's own personal hell in NOT MY BAG, a new original graphic novel coming from Image Comics on October 10. Grace is the artist on the indie comics favorite THE LI'L DEPRESSED BOY, written by S. Steven Struble, and was editor of Robert Kirkman's comics until stepping down to pursue a full-time art career. In NOT MY BAG, he chronicles the six months of his life that he spent as a sales associate in an upscale department store. Grace tries to cater to both customers' taste and the demands of his management, all while the ghosts of relationships past haunt him and his artistic dreams wait for the bills to be paid. "Not My Bag is a celebration of all of my passions: comic books, fashion, and the gothic genre," said Grace. "Image Comics sees what I see in this book, and I'm excited to share something that is my unabashed love letter to funny books... by way of retail hell." In advance support of his graphic novel, Grace has done interviews with the L.A. Times and Comic Book Resources, and pieces will also be running in The Hollywood Reporter and Newsarama. A preview of NOT MY BAG appears in THE WALKING DEAD #102. 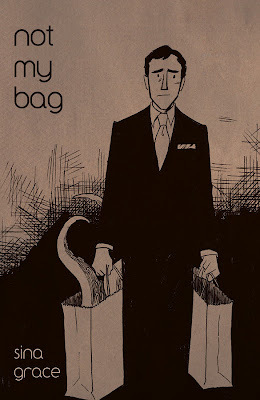 A 96-page, black-and-white graphic novel, NOT MY BAG (AUG120476) will be in stores on October 10. It is available for pre-order now from the August issue of Previews. Review copies are available upon request; please email Jennifer de Guzman at jenniferdeguzman@imagecomics.com.